Villa Casa has besides a flat roof also a massive pitched roof serving as a sunscreen. All Villa Casa models have two large front doors, which can also be used as landing flaps. The side doors allow to attach a bathhouse or a nesting box, making the aviary a perfect home for your feathered friends. An all-acrylic splash guard at the bottom of the cage keeps the surrounding area clean. 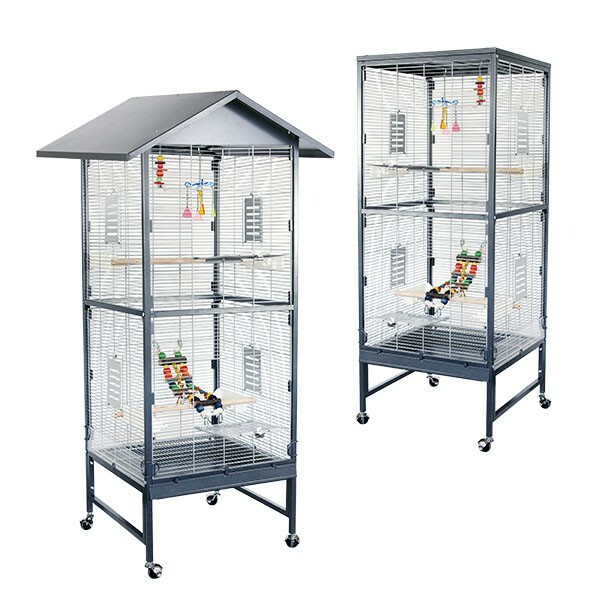 These models are additionally equipped with a slide out grill, permitting the easy cleaning while keeping the birds inside the cage. Both colour combinations Choco/Vanilla and Antik/Platinum are in accordance to the current design trends and perfectly fit to each and every surrounding. Villa Casa 60 is coated with the patented Avilon powder - this special non-toxic powder coating is the best choice for your parrot. links "Villa Casa 60 – Antik/Platinum (Antique/Stone White) Bird Cage with Avilon Powder Coating from Montana Cages"
customer reviews on "Villa Casa 60 – Antik/Platinum (Antique/Stone White) Bird Cage with Avilon Powder Coating from Montana Cages"
Diese Voliere ist super für meine 2 kleine Ziegensittiche. Haben sich schnell dran gewöhnt und fühlen sich mittlweile pudelwohl in der Casa 60.Dieser hat eine gute Qualität und ob mit oder ohne Dach optisch sehr ansprechend. Dach verbeult und die Sitzstangen angefressen/morsch. Nach 15 Tagen immer noch keinen Austausch erhalten. Dient als Aufenthalt/Schlafen für 4 Wellis, sonst Freiflug. Stabile, solide Geschichte.